The Enterprise is in a direct line of descent from The Falmouth Local, which was established in a shoe store on Main Street by Lewis Foster Clark in 1886. The Local started out in a building on the shore of Shivericks Pond and eventually moved to the building that is now occupied by Caline for Kids. 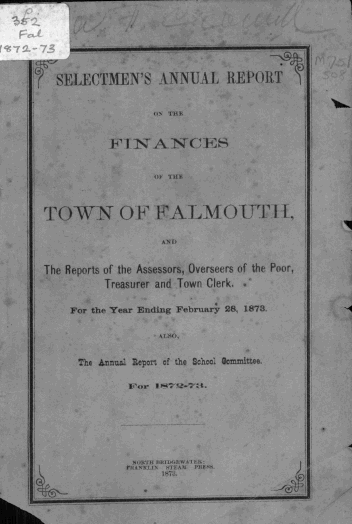 Charles Sumner Burgess bought the Local in 1895, renamed it The Falmouth Enterprise and published it for the next 30 years. In 1925 Harry Albro bought The Enterprise, and four years later, George A. Hough Jr. bought the paper. George Hough Jr. was the grandson of a Martha’s Vineyard whaling captain. His father was, for 40 years, editor and managing editor of the New Bedford Evening Standard. He was a graduate of the Pulitzer School of Journalism at Columbia. When he bought The Enterprise he had been the city editor of The Evening Standard for several years. Co-publisher of The Enterprise was his wife, Clara Sharpe Hough, who also attended the Pulitzer School. It was the first time The Enterprise was published by trained professionals. "The Enterprise," the new publisher wrote on Page One, "has no entangling alliances. Its ownership is personal. It is hampered by no financial responsibility to any outside business or selfish interests. There will be no absentee control here." The third generation of the Hough family now publishes the paper. Its offices are on Depot Avenue, where they were moved in 1931, and the press facility today is in the Falmouth Technology Park. 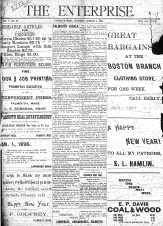 The Enterprise today publishes four newspapers, having added editions in Bourne, Sandwich and Mashpee. "This being the first report of the kind that this town has had printed, and in consideration of such a report, as a matter of record, appearing annually as we trust they will hereafter, to be filed away by each inhabitant of the town, we have thought it advisable to insert the length of time each Town Officer has held the position occupied by him during the year." This project was made possible by a grant funded by the Community Preservation Committee under the Community Preservation Act in 2013.